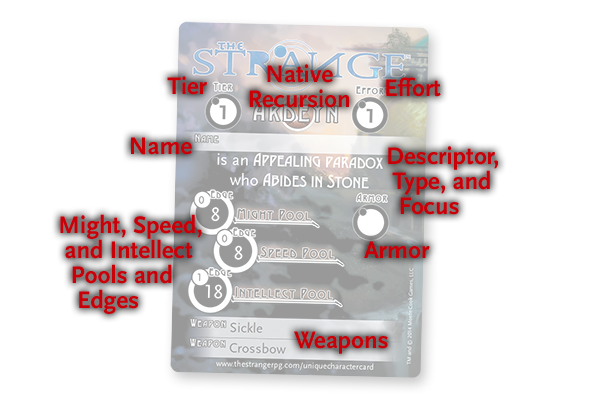 Your unique character card for The Strange is just that–unique. No two cards are the same; each has its own combination of descriptor, type, focus, and stat values making it a playable character. Name and equip your character, and it’s ready to play in any The Strange game. Here’s what everything on your card means. Tier: Your tier is a measure of your character’s power, toughness, and ability. Player characters can go up to tier 6, but even a tier 1 character in The Strange is capable and dangerous. Native Recursion: Your character is native to Earth or one of its two most prominent recursions, Ardeyn or Ruk. Your focus (see below) is in part determined by your native recursion. Name: What’s your character’s name? That’s for you to decide. The adjective is called your descriptor. The noun is your character type. The verb is called your focus. In the Cypher System (the game engine underlying The Strange, as well as the Numenera RPG), every player character is defined by his or her descriptor, type, and focus. Might, Speed, and Intellect Pools and Edges: Every player character has three defining characteristics, which are typically called “statistics” or “stats.” These stats are Might, Speed, and Intellect. They are broad categories that cover many different but related aspects of a character. Each stat has two components: your Pool and your Edge. You have a Might Pool and Might Edge, a Speed Pool and Speed Edge, and an Intellect Pool and Intellect Edge. On your unique character card, the number in the larger circle is your Pool, the number in the smaller circle is the associated Edge. When you choose to spend points from a Pool (such as when you apply Effort), you deduct the Edge first, and the total number of points you spend is reduced accordingly. Effort: When your character really needs to accomplish a task, you can apply Effort. For a beginning character, applying Effort requires spending 3 points from the stat Pool appropriate to the action. An Effort of 1 means you can only apply one level of Effort. Armor: Depending on the equipment your character has (your focus provides a list of starting equipment that is described in The Strange corebook), you might also have an Armor value. When you take damage, you normally get to deduct your Armor value from it first before the damage affects your Pools. Weapons: Your character begins with a weapon or two.